Another precious corduroy longall for your little boy! 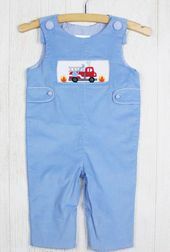 This is made with light blue corduroy and has side tabs. The shoulders button with blue gingham covered buttons and the same blue gingham trims the smocking and tabs. 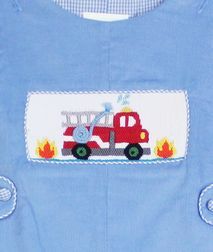 The center chest has a large rectangle area of smocking that has a very detailed hand embroidered fire engine truck. It has real blue small rope as the fire hose!